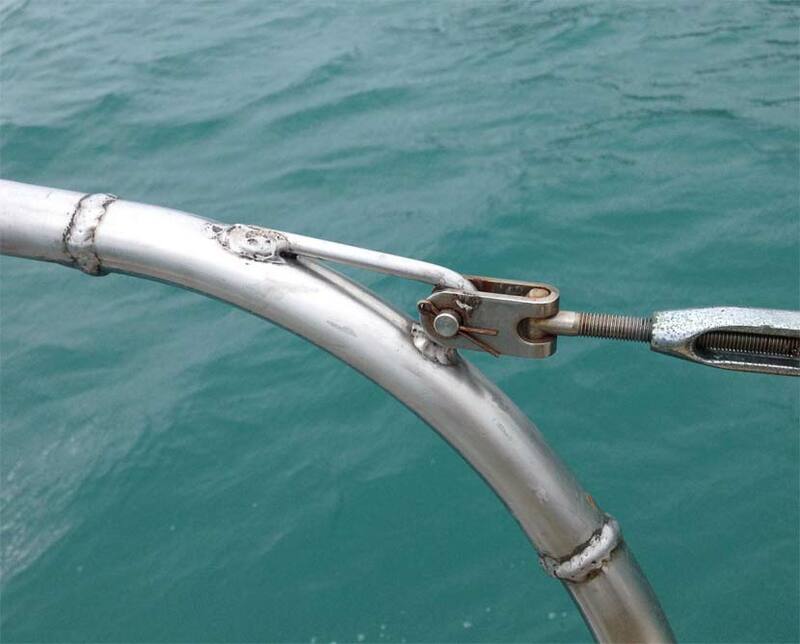 In Panama as we were preparing to leave I discovered a small crack in the bow pulpit right where the bail connected with the lifeline. It was a wee bit o’ a problem but one I felt I could temporarily live with. I pulled and tugged and pushed on it and the metal didn’t move; but I knew it would be suspect spot and I needed to treat it with respect. We have jack lines so it wasn’t like I would be hanging on with my life via the lifelines; but I would always need to be aware of this potential failure point until it can be repaired. the next leg of the trip would be 3,000 miles I wanted to do something to shore it up. I was able to find two SS U bolts and I scrounged a block of wood. Then I could sister the wood to the pulpit by clamping the item to the SS tubing and making sure that the wood was held in place and in line with the pulpit. It wasn’t like new; but I felt much better about the strength of the SS piece with the wood support. Finally; after living with my jury rigged repair for 5 months or so we happened upon a marine welding shop and W/ and I asked if they could repair the pulpit. 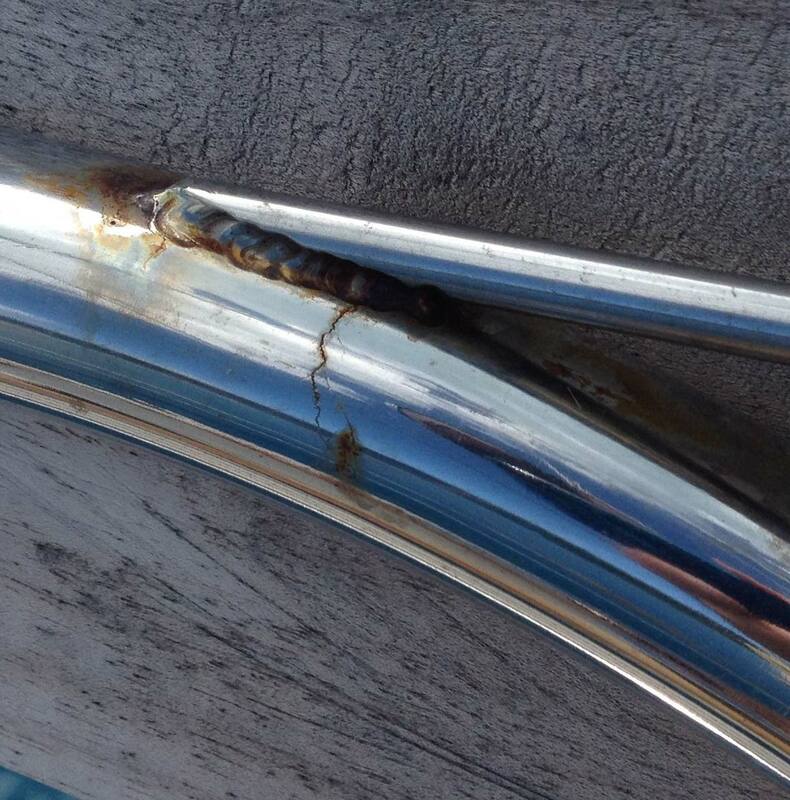 Mark on sv Mystic; a welder by trade, said it was a little job and the repair would be “no big deal”. The problem with little jobs on boats is no one, I mean NO ONE, wants to do them. Here included. I had recognized that they would need to see the crack so I brought in a picture on my camera. That helped. But they indicated that the SS was “dead” (whatever that means) and if they welded it closed it would fail sooner than later. I felt they were just wanting to beg off. But I figured here we would have about the best chance of having this fixed so I asked if they couldn’t just replace the piece. That they could if they knew what size of SS it was. So back to the boat I run with the dinghy, grab the calipers and measure. Hop in the dinghy again and back to the yard I go; they then look to see if they have the right size SS tubing. W/ and I talked about the job and figure we’ll go $80-$100 US. After they found the SS they quoted us 80 euros. Slightly more than we wanted to pay but OK, it will be done and we’ll cross it off the list. The rest of the day we prepared for the job. 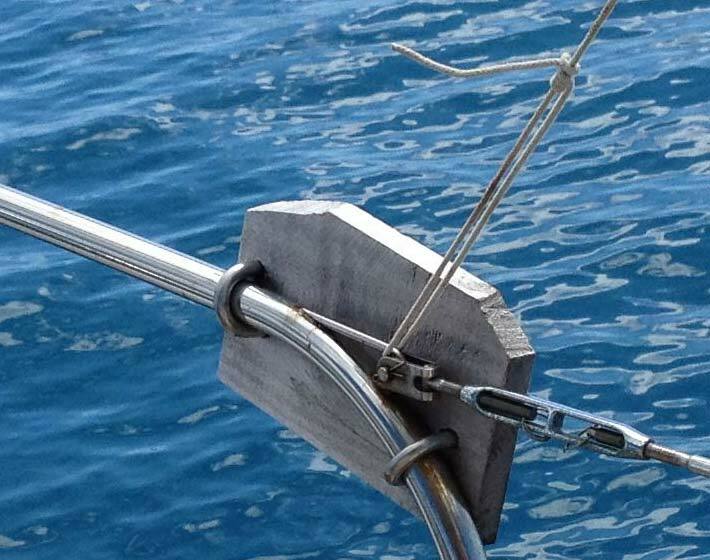 I pulled the one remaining navigation light off the sprit and snaked the wire back out. In the morning when we arrive at the marina I’ll shut the boat down and disconnect the negative wires to the batteries as Mark suggested. That shuts the ground down on the entire boat. The following day we brought Elysium into the marina and hung the sprit over the walkway so they could do their work. A bit later the boss and the welder showed up and the job began. First they made a replacement piece and then he cut out the curve with the crack. I thought the order was a little off but hey; I don’t like telling professionals how to do their job. After he cut the pulpit piece off he put his new piece in place and the bend was wrong. They needed to go and bend another. I just couldn’t help my self, I dug out the wooden sister piece I had been using and loaned that to them. On it was a perfect match for the curve of the SS pulpit. They returned with a correctly bent piece now that was close enough to exact that no one would see any differences. An hour later they were finished. There are large weld beads where they joined the two pieces and I asked about making them flush and polishing. In the states that IMHO would have been part of the job. In Columbia too! They indicated that if they did grind the welds flush the piece would just snap right off. I asked about polishing and the boss indicated that it wasn’t part of the quote and he indicated they didn’t have the materials to do that anyway. (Personally I kind of felt that a welding shop would have what they need to polish up their work but again I’m thinking I’m back home). I’m not sure I believed them, maybe had I been able to speak French things would have gone smoother. Maybe not. But; the job is done, I have full strength back in the pulpit and I guess, if I get really bored someday, I can polish it up. Till then the pulpit is better now than living with the wood piece there just asking to snag any line that comes close. In the next day or so we’ll move up the “Aquarium” and do a short snorkel through a very shallow ocean pass. Right now we’re just thankful we can cross a major project off the list.